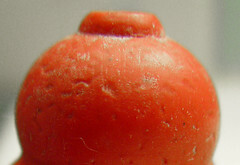 it’s a miniature pinscher sized Kong, a dog toy you can put treats into…Wolf LOVES it, and occasionally even Max, the anti-dog toy dog, will play with it. The hair of the Wolf. Either dog hair or a shredded wheat. Either you got a new fur coat, or it’s Wolf’s fur! You’re still carrying around that old rabbit’s paw keychain? Give it up already. I’m seeing dog fur but I figure that’s too simplistic. So far I haven’t come up with any better ideas though. A mustache? Or a dog’s facial hair? Or something else I’d really rather not think that you posted on your blog. In keeping with the theme, hair of the dog! Wolf that is! That is either something disgusting, or following in the dog tracks, it is the inside of Wolf’s ear. 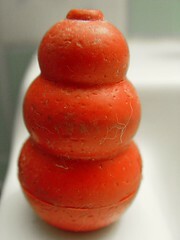 oh yeah, I never would have come up with the kong toy … but now I am thinking I need to find one for Fern. 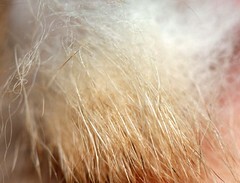 New Pic: could it be the tuft of hair from a mexican hairless? looks like someone better get a tweezers for those chin hairs …. I just tossed a container of something from the very back of my fridge that looked EXACTLY like that….I don’t know what it was so could YOU tell ME?? The goatee of an co-worker? hmm…as i’m seeing what looks like a little skin in the background i’m agreeing that its that little tuft of hair at the base of a dog’s ear…. Cheri says: As blatantly tempting as this one is, I will refrain from my usual Ann Coulter reference. Laura says: An old person’s hair. Looks like a tuft a hair growing below a tummy yearning to be scratched.